Did you know that in UK, Ireland and Australia, a flapjack is a sweet tray-baked oat bar made from rolled oats, butter, brown sugar and syrup, and that in Canada, the US, and South Africa a flapjack is a pancake? Well, these flapjacks are pancakes but made from rolled oats, cornmeal, and brown sugar drenched with 100% golden Canadian maple syrup. So I guess in a way they are the best of both. The recipe hails from Rebekah’s friend Helen for which I’m very grateful. They would be fabulous on a canoe trip, where Rebekah and Helen met, as you don’t need eggs, butter, or milk. But I just had them this morning, and they are equally tasty in downtown Toronto on a sunny Sunday morning with a good stiff cappuccino in hand. Mix all the dry ingredients together in a large bowl. Remove 1 cup of dry ingredients into a second mixing bowl. To the 1 cup dry ingredients, add 1 cup of soy milk and 1 tsp of vanilla extract. Mix well. Add blueberries if you so desire. Add a little more soy milk if the batter is too thick. 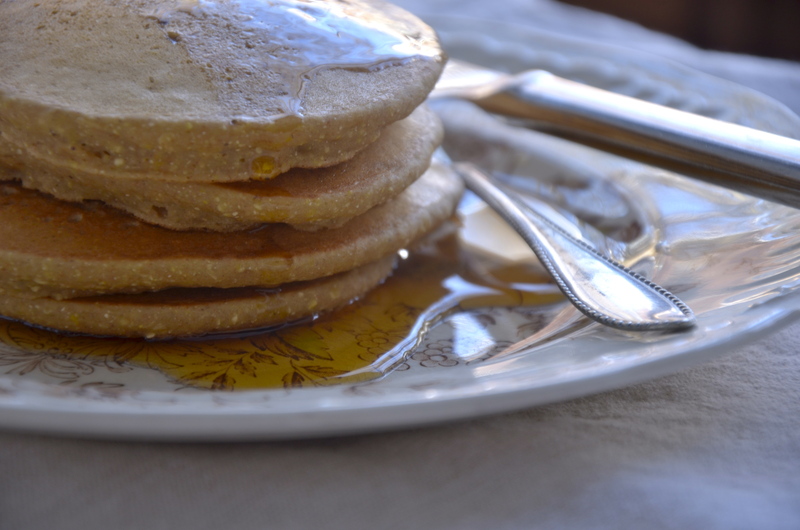 Cook on a pre-heated griddle and serve piping hot with maple syrup or homemade marmalade. Put the rest of the dry ingredients in a airtight container for next Sunday.